After lots of rumors and leaks of many formats, Mi Max 3 is now confirmed by Xiaomi. The Chinese company is working hard to internationalize more and more products or its hardware features. Xiaomi confirms the Mi Max 3 and its 6.9-inches IPS LCD screen. In the case of a phablet, it is natural that the size of your display is perhaps the most quoted and popular feature, but the Xiaomi Mi Max 3 recovers a successful hardware formula presented in 2018: the Xiaomi Redmi Note 5. Among several of its specifications, Xiaomi announces the Xiaomi my Max 3 and, in addition to detailing these features below, we will show official images and mention the prices and colors in which the two variants of this smartphone can be obtained. 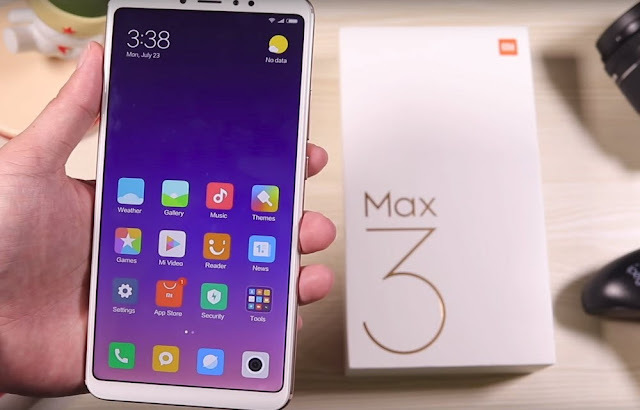 The Xiaomi Mi Max 3 features a 6.9 inch IPS LCD display, as we mentioned; With a Qualcomm Snapdragon 636 processor working at a frequency of 1.8 GHz, 4 and 6GB of RAM memory paired respectively with 64 and 128GB of internal storage capacity. A dual rear camera with a 12-megapixel aperture sensor f/1.9 and PDAF and another 5-megapixel sensor with aperture f/2.0 A previous camera with 8-megapixel sensor, Dual-volt connectivity, Wi-Fi 802.11 ac, Bluetooth 5.0 and a C-type USB port, A 5500mAh battery with quick Charge 3.0 support for fast charging. And finally, Android 8.1 Oreo installed from the factory with its pertinent skin MIUI 9.5. Xiaomi announces the Xiaomi Mi Max 3 and does it with facial recognition system, a rear camera able to identify different landscape contexts to choose the best image configurations for the capture and the Voice assistant Xiao introduced with the latest MIUI version. The Xiaomi Mi Max 3se will present in colors "Black stone " ( "Black Stone "), "Deep sea blue " ( "deep ocean blue ") and "Dream gold " ( "dreamy gold ") and can be purchased for approximately US $250 or US $300 depending on whether the variant is chosen with 4 or 6GB of Ram.